Founded by three like-minded friends hailing from Persia, France and the UK, Cuemars is a boutique dedicated to conscious consumerism. The space showcases ethical products, including their own designs. Discover design-led lighting, language inspired clothing and botanical products, surrounded by an abundance of plants and greenery. "People are starting to show more interest in the production process of products they buy, as well as sustainability and where they come from. 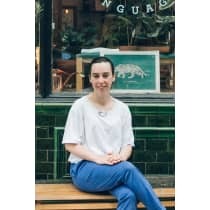 I think this will only grow as people turn to independent retailers to provide these types of products, making the link between the maker and the buyer much stronger."